The Northern Long-Eared Bat is a medium-sized bat with a body length of 3 to 3.7 inches but a wingspan of 9 to 10 inches. Their fur color can be medium to dark brown on the back and tawny to pale-brown on the underside. As its name suggests, this bat is distinguished by its long ears, particularly as compared to other bats in its genus, Myotis. Northern long-eared bats spend winter hibernating in caves and mines, called hibernacula. They use areas in various sized caves or mines with constant temperatures, high humidity, and no air currents. Within hibernacula, surveyors find them hibernating most often in small crevices or cracks, often with only the nose and ears visible. During the summer, northern long-eared bats roost singly or in colonies underneath bark, in cavities or in crevices of both live trees and snags (dead trees). Males and non-reproductive females may also roost in cooler places, like caves and mines. Northern long-eared bats seem to be flexible in selecting roosts, choosing roost trees based on suitability to retain bark or provide cavities or crevices. This bat has also been found rarely roosting in structures, like barns and sheds. Breeding begins in late summer or early fall when males begin to swarm near hibernacula. After copulation, females store sperm during hibernation until spring. In spring, they emerge from their hibernacula, ovulate and the stored sperm fertilizes an egg. This strategy is called delayed fertilization. After fertilization, pregnant females migrate to summer areas where they roost in small colonies and give birth to a single pup. Maternity colonies of females and young generally have 30 to 60 bats at the beginning of the summer, although larger maternity colonies have also been seen. Numbers of individuals in roosts, typically decreases from pregnancy to post-lactation. Most bats within a maternity colony give birth around the same time, which may occur from late May or early June to late July, depending where the colony is located within the species’ range. Young bats start flying by 18 to 21 days after birth. Maximum lifespan for the Northern Long-Eared Bat is estimated to be up to to 18.5 years. Like most bats, northern long-eared bats emerge at dusk to feed. They primarily fly through the understory of forested areas feeding on moths, flies, leafhoppers, caddisflies, and beetles, which they catch while in flight using echolocation or by gleaning motionless insects from vegetation. The Northern Long-Eared Bat is one of the species of bats most impacted by the disease white-nose syndrome. 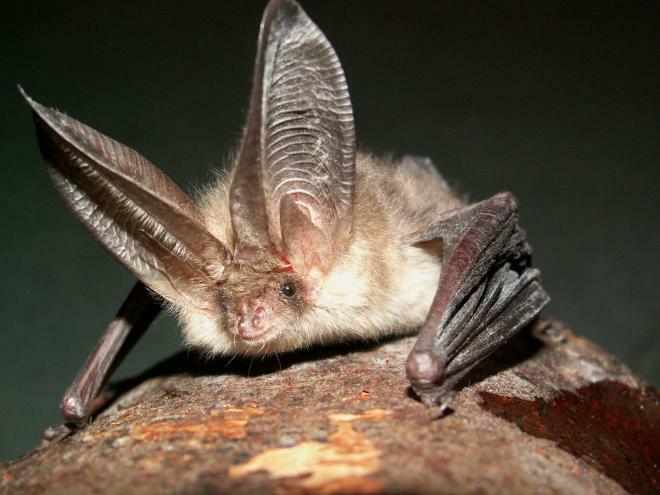 Due to declines caused by white-nose syndrome as well as continued spread of the disease, the northern long-eared bat will now receive protection as a threatened species under the Endangered Species Act. The Service proposed the northern long-eared bat as endangered in October 2013. During review of the threats, we determined the northern long-eared bat meets the Endangered Species Act’s definition of threatened. Under the Act, a threatened species is likely to become endangered in the foreseeable future, while an endangered species is currently in danger of becoming extinct. Learn more about Northern Long-Eared Bats!